Abu Dhabi, the capital of the United Arab Emirates, features larger-than-life luxury and exotic desert landscapes. Join Modern Day Explorer Max Aly as he scouts local activities and inclusions for itineraries from SITA World Tours to Abu Dhabi. Adventure awaits you in Rub al Khali, one of the largest deserts in the world. Go camel riding, fat biking and dune bashing with Modern Day Explorer Max Aly of USTOA tour operator member SITA World Tours and discover his expert tips for exploring this incredible destination. Abu Dhabi redefines the concept of luxury with fabulous hotels, elegant restaurants and splendid shopping. Go behind the scenes with USTOA’s Modern Day Explorer Max Aly and discover the luxurious accommodations and experiences available to SITA World Tours guests. Ancient traditions and modern luxury coexist in perfect harmony in Abu Dhabi. Get an insider look at the culture that awaits you in this modern metropolis with Modern Day Explorer Max Aly as he scouts experiences and inclusions for itineraries from USTOA tour operator member SITA World Tours. Interested in learning more about Max’s journey to Abu Dhabi? Go behind-the-scenes with him as he uncovers a modern metropolis with desert flavor. Ready to visit? Visit here for details on traveling to Abu Dhabi with SITA World Tours. Max joined SITA in 1993 & has worked in various capacities from sales to operations to product development. Possessing a vast range of experience in the field of tourism, he is ideally suited to serve as SITA’s ambassador in the Modern Day Explorer role. Max started his career in tourism in India as a tour guide and has since traveled widely throughout Asia, Africa, Europe, North & South America and the South Pacific. His destination knowledge is of immense value not only to the organization but also to many of the clients whom he comes in contact with. Discover more destinations with our team of Modern Day Explorers here. Though I had often connected through the Abu Dhabi airport and enjoyed a bird’s eye view of this desert Emirate while landing and taking off, I had never actually set foot outside of the airport. I was therefore intrigued and excited when USTOA, on behalf of the Abu Dhabi Tourism & Culture Authority, approached SITA World Tours with the opportunity of exploring this fascinating destination. From the moment I landed until I left five days later, the experience left me wondering why I had waited this long to grasp what turned out to be an incredible desert adventure. Abu Dhabi is absolutely captivating. With its fabulous architecture, luxurious accommodations, fine dining and myriad attractions wrapped in warm Arab hospitality, it defines the very nature of tourism at its best. 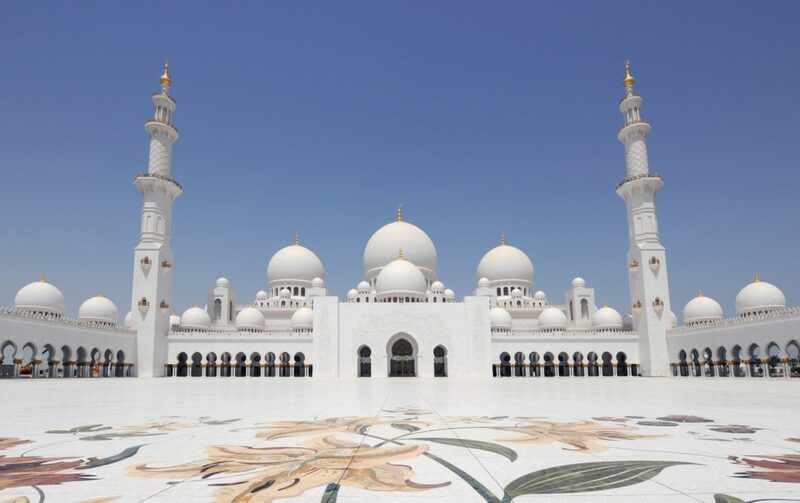 Abu Dhabi is not only the political, but also the cultural capital of the United Arab Emirates and host to the Formula 1 Etihad Airways Abu Dhabi Grand Prix, World Cup Sailing and other leading international events relating to art, music and sports. Very soon it will be home to the Louvre and Guggenheim Museums, as well – they are expected to open later this year. I am at a loss to describe my feelings upon beholding the Sheikh Zayed Grand Mosque. To say I was overawed would be an understatement. It is a poem in white marble with delicately inlaid floral patterns created from multicolored semi-precious stones. The interior of the mosque is equal to the exterior. The sheer size is overwhelming and all of the superlatives applied to describe this magnificent edifice are completely justified. It must be seen to be believed. I was afforded a personal tour of the Abu Dhabi Falcon Hospital by the incredibly charming and accomplished Dr. Margit Muller, director of the facility. To most citizens of the Arabian Desert, the falcon is like family and an integral part of their cultural heritage. This is exemplified by the care and attention that is lavished on these birds here at the most advanced and sophisticated falcon care institution in the world. Falconry and falcons are held in such high esteem in the Arab world that each individual bird merits his or her own passport to facilitate travel. Abu Dhabi is truly a family friendly destination. There are countless activities for children… as well as the inner child in most adults. For example, the Formula Rossa, the world’s fastest roller coaster at Ferrari World, leaves one breathless with excitement. For those wishing to dispense less adrenaline, there are more sedate activities to be pursued as well. The Abu Dhabi Pearl journey, where you can pull out your own pearl from a freshly harvested oyster, a visit to the Emirates Zoo, the Heritage Village, Yas Waterworld and an umpteen number of beautiful beaches and marinas to relax and soak in the ever shining sun. The beautiful Abu Dhabi Corniche is a promenade, a place to see and be seen. Leaving the gleaming metropolis behind me, I headed out into the vast desert with my guide Amaan. The Rub Al Khali, which literally translates to ‘The Empty Quarter,’ certainly lives up to its name. The silence is deafening and the tall sand dunes, stunning. We drove for miles and miles until we reached the resort oasis of Qasr Al Sarab, an amazing property located in the very heart of the desert wilderness. Managed by the Anantara group, this hotel captures the desert romance and tastefully blends it with all the modern luxury a discerning traveler appreciates. Desert adventures awaited me at the Qasr Al Sarab. We went dune bashing in specially equipped 4WD vehicles, ascending steep dunes and descending gut-wrenching drops. 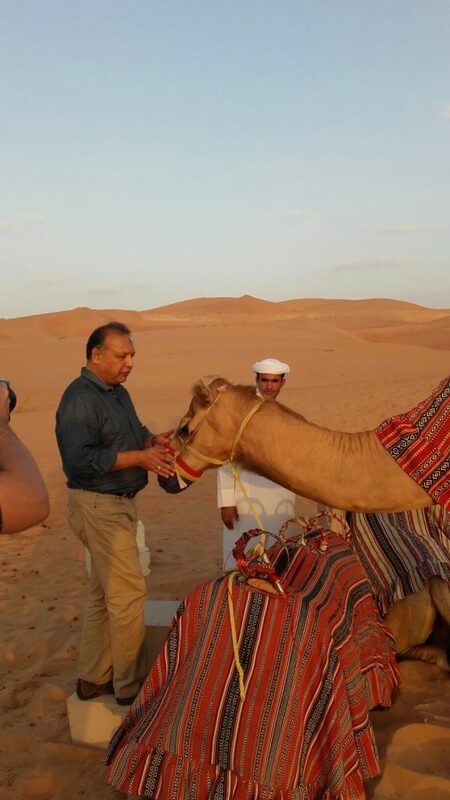 The camel ride that followed calmed me down after this exhilarating adventure. The camel, also known as the Ship of the Desert, serves the desert dwellers in multiple ways and is among their most precious possessions. Later in the evening a banquet under the desert sky left me with the surreal feeling of living the Arabian Nights. The sky was a riot of stars and constellations. Having witnessed a fast fading sunset, I rose before the sun in order to witness a glowing desert sunrise from atop a dune, enveloped in peace and tranquility. 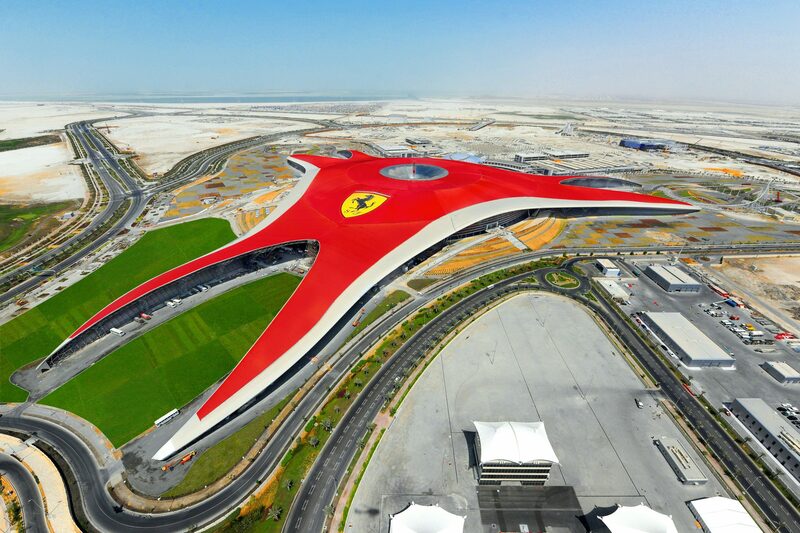 Abu Dhabi redefines luxury! In order to soak in as many experiences as possible in the short span of time, I stayed at a different hotel each night. 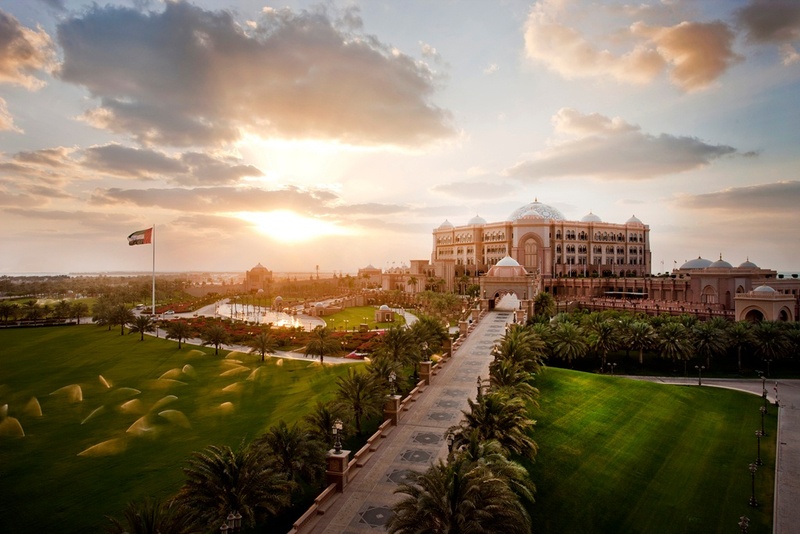 The Emirates Palace qualifies as a tourist attraction in its own right. The central cupola of the hotel is as high as St. Peter’s basilica and was decorated using 39 tons of gold. A gold cappuccino is served in a cafe close by. The Bab Al Qasr, the Rosewood, the Dusit Thani and the Crowne Plaza on Yas Island are among the many luxury hotels that are recommended in Abu Dhabi. The city also abounds in Michelin starred restaurants featuring every conceivable cuisine. The Sunday brunch at the Jumeirah at Etihad Towers is to die for. The street food is equally delicious and there is something tasty to match every purse. For the shopaholic, Abu Dhabi is a veritable paradise. Apart from the trend setting malls and the bazaars, exceptional bargains are to be found regardless of what one seeks to buy or browse. As a Modern Day Explorer I am completely sold on Abu Dhabi – a modern metropolis with a desert flavor – and welcome all travelers to call SITA World Tours so we can make your experience equally rewarding! Interested in learning more about Max’s journey to Abu Dhabi? Go behind-the-scenes with him in our video series, A Modern Day Explorer’s Quest to Abu Dhabi, launching later this month here.